With the 24th pick of the 2013 NHL Draft the Vancouver Canucks select, well we don’t know who they’ll pick. General Manager Mike Gillis has yet to release the team’s draft board to the public so we are left to speculate. While the search for the next Vancouver head coach continues, Gillis and his staff are also preparing for the NHL Draft at the end of the month. This is the first profile in a series of players the Canucks should consider using their first round draft pick on. At 24 it is unlikely that Vancouver will be able to select a player that will bring an instant return on investment in 2013- 2014. However, they are still in a position to pick up a guy who can help them in the next couple of years. Zykov is a big Russian born forward who played last season in the QMJHL with Baie-Comeau Drakkar. Coming over from Europe many players wilt under the more physical North American game. That wasn’t the case with Zykov. Zykov potted 40 goals and 75 points in 67 games for the Drakkar last season and with his physical game would be a good fit for Vancouver. The Canucks have been looking for more physical players and despite the ‘non-physical’ collar that many Russian players get tagged with, Zykov goes against that mold. Coming in at 6’1″ 215 pound St. Petersberg native played a game that is best described as a power forward. He skates hard, grinds out pucks on the boards and is not afraid to park his frame in front of the net. He could turn out to be everything Zack Kassian is supposed to be. Zykov plays a solid two-way game and takes care of business in his own end — something that Gills favors in a prospect. 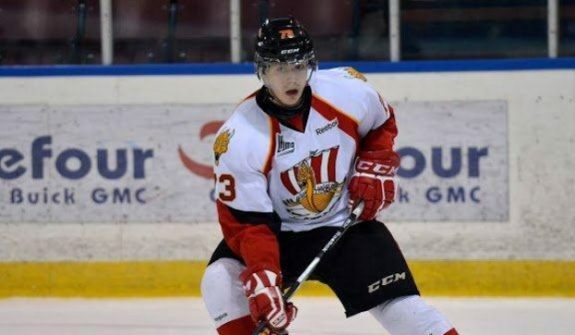 He has been somewhat unheralded and has not received the attention that other CHL prospects have. That also seems like the kind of player that Gillis likes to pluck out of the pile. It’s no sure thing that Zykov will be available when Vancouver selects at 24. He is ranked all over the place by the draft-nicks out there — The Hockey Writers have him ranked 18th and others have him as low as 37th. Many consider Zykov a project type of prospect as his skating ability has been suspect — although reports are that he showed some improvement as the season progressed. For Vancouver, they may not feel like they are in a position to take on projects. After two early exits in the playoffs they might choose to look for a player who is ready to go sooner than Zykov might be. There may also be some question how legitimate his 40 goal season in the QMJHL was last season. The year before, playing in Russia he only managed five goals in 52 games against what would be assumed lesser talent. Was this just the result of a player blossoming at the age of 17 or was last season a fluke as he played for a good squad with the Drakkar? The Canucks have gone to Europe in past drafts with a great deal of success and may look to do so again. Zykov has a lot of the tools that Vancouver seems to be searching for despite some of his rough edges. He’s big, physical, can score and plays with grit. It’s the one thing that the pundits feel the Canucks have been missing. 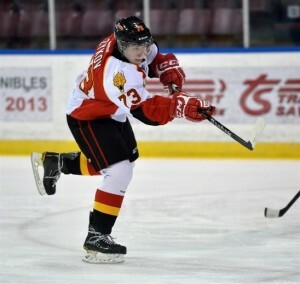 Stay tuned in the coming weeks as we will continue to profile players that Vancouver may target in the 2013 NHL Draft.